I’ve spent the last two days playing tour guide to two friends in town from Prince George. Nothing helps me get past Friday night drinking like Saturday morning brunch. I took our three-man wolfpack (yes, we recycled jokes from The Hangover – don’t pretend you never have) to the Templeton on Granville. I adore the Templeton. Angela and Pat adored the Templeton too. We took turns ordering and once it was Angela’s turn, I was instantly in awe. “I’ll have a coffee, some water, the New Denver Omelet and a chocolate milkshake.” It was 9:00 a.m., we were slightly hungover and each had empty stomachs. Any girl that can order a chocolate milkshake under such conditions gets my respect. Let me be honest: I love food and my appetite does not shame me. 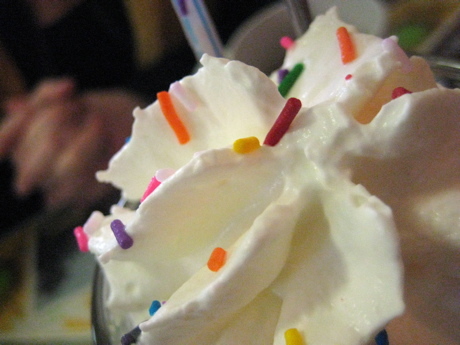 I believe that milkshakes, mochas and pumpkin pie are pointless without a mountain of whipped cream. Chips always go better with dip. If you make me pancakes on a Saturday morning, I’ll smother them with butter and syrup before devouring the entire stack. Were I to live in France, I’d be nothing short of fat since I’d consume nothing other than chocolate, cheese, red wine and parisian bread with olive oil and balsamic vinegar. Obviously the value of balanced eating can’t be overlooked – and believe me, this girl loves her vegetables. But wouldn’t you rather be five pounds heavier and not neglect the good stuff? The concept is simple: eat what you love and love what you eat. Foodies unite. totally -you’ll never ever catch me ordering a skim milk latte. here, here….i believe i am 5 pounds heavier because i haven’t been neglecting the good stuff. one of my favorite indulgences: the bread under the escarcot at la regelade french bistro in west van. super garlicy olive oil soaked bread. yum yum. My problem is that it doesn’t stop at five pounds…I am trying hard to stay on track but don’t begrudge myself the occasional treat. Answer to that question is always yes. YESSSS load the whip cream on and add sprinkles too because they are special. My secret hangover cure is milk and mochas do a fine job.